I first discovered Gerri Ravyn Stanfield when a friend forwarded her newsletter to me. Poems are my medicine, and I felt inhaled by the poem Ravyn had shared–and then breathed back into the world more awake, more aware, more myself. This led me to acupuncture treatment with Ravyn, through which we restored some of my core stories and foundational strengths. Ravyn radiates wisdom, kindness, and compassion. The guidance she has offered through metaphor and story have been as much a part of my healing journey as the acupuncture. I am so grateful she has made this transformational wisdom widely available in her new book Revolution of the Spirit: Awaken the Healer—which I believe every writer and every human needs on their bookshelf. It is a great honor to discuss some of the insights from Revolution of the Spirit with Ravyn here. What makes a person a “revolutionary healer”? Does everyone practice some kind of medicine? Do we all have something to contribute to our collective healing? The root of the word healing is the Old English hal, which means to make whole. No matter who you are, there will be a time in your life where you must heal something that is broken. Maybe that something is your body, or maybe it’s a broken heart. Maybe that something is the state of the world around us. If you use your life to mend what’s broken, you practice some kind of medicine. You might not know the name of your kind of medicine yet, or you might know exactly what I mean, because you have healed in this way ever since you were a child. We have to expand our definition of healing to encompass all the ways we positively contribute to our communities. I dare you to interview the ones around you to find out how you make their lives more wonderful. Their answers will reveal some of your medicine. It sounds too simple to be true, but to practice your medicine is to do the thing that you do well. When you do that thing you do, it heals every one of us. It is part of why you are here, the unique soul fire that you bring to this time. And the gift you have to share is likely part of your deepest wounding, some initiation that you have survived. You have certainly made it through some kind of hell and you can show us how you did it, help us along, allow us to learn from your experience. The revolutionary part comes when we recognize that the skills of the healer, (to listen and observe, diagnose, treat/act and reassess) need to take center stage in these uncertain times. For thousands of years, we did not split human beings into compartments. Body, mind, soul and spirit often needed similar treatments to become whole again. All revolutions involve that which is sacred to us. We aren’t here so much to save the world but to heal the damage within our reach, to find the most important problem to which we are part of the solution, to accept our own unprecedented healing powers and take action. It is going to take all of us to mend this world. You practice acupuncture. As an acupuncture patient of yours and now a reader of your book, it seems to me that you also practice story medicine. Can you tell me how this works? How do you use story as medicine, and how can other writers do the same? I wrote this book about healing the world because sometimes, words are everything we have. Storytelling is one of our most potent human medicines. To write is to clasp hands with the place where all stories are born. The best tales spring from our collective unconscious dreamscape and we understand ourselves more deeply when we hear them. There is something deeply healing about living inside a universal story. I am a cancer survivor and in my acupuncture practice, I treat a lot of women surviving cancer. If we lived in another time and society, cancer could be viewed as an initiatory experience, literally facing death and transforming ourselves. When I ask my patients if cancer feels like an initiation, no one has ever told me to piss off, in fact, they ask more questions about initiation or they get tears in their eyes. The only way I survived my surprise divorce after 17 years of marriage was to write the story one hundred different ways. I especially like the medicine of taking the painful events of the present and putting them in the middle of the piece, then writing the climax and the end. When we practice story medicine, we become alchemists. You must begin with the insurmountable obstacle and transform it until you no longer recognize it because it has been polished into something that shines. What does it mean to dream the beginning of the world instead of the end, and how do you do this? I get out of bed to see what will happen next in this chaotic human experiment of life on earth in these times. I wake to see who is channeling beauty and serving the power of art and where the inspiration lives today. In my classes, coaching and acupuncture practice, I get to train global revolutionary healers and hold space for people during their alchemical transformations. I write stories and make art to help us create the beginning of the world, not just the apocalyptic fantasies that Hollywood is fond of making. I practice hope as a martial art. I repeat to myself, “every day is sacred”. In our current industrialized culture, I see interlocking systems of oppression, like a web of lies, systems that try to convince us that some humans have more value than others. I want us all to unravel that web and reweave a world of justice and fierce love with our words and actions. How has allowing love and beauty in contributed to your own healing? And why is it revolutionary to do so? I have been terrified to love people on and off for my entire life. What a scary freaking thing we do, to make other humans vital to our survival when we will certainly lose them in some way. And without love and support, I shrivel up and fall down under the weight of trying to do it all by myself. Every time I ask for help, I remember my interdependence in the web of life. Each time I allow someone to see me when I am feeling small, I remember what is sacred to me, what matters most to all of us. I will give you a hint, it is not money or greed. When we recognize what is sacred in the modern world and act on its behalf, that is revolutionary. That is fierce love. You offer some provocative revolutionary healing dares that invite readers to stay with their own stories, and others’ stories, long enough for them to become alchemical and surface their treasure. I wonder if you might leave my readers with such a dare? I dare you to ignite your soul fire, your healing gift. Stop comparing yourself to other people. Fall in love with your wounded healer self, in all your imperfections and bad habits. There is a tiny divine flame inside your heart that fuels everything you do. It only wants to dance and shine. Listen to your intuition. It is your job to tend your heart flame when life gets cold and play with it as much as you can. Reignite your soul fire when it goes out. You are incendiary. Find your tinder. Strike the match. You are the only one who can make the spark. 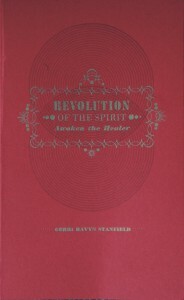 Gerri Ravyn Stanfield is the author of Revolution of the Spirit: Awaken the Healer, a guide to liberate the healing super powers within each of us. She practices acupuncture in Portland, Oregon and works with Acupuncturists Without Borders to build world healing exchange programs. Ravyn designs trainings for emerging leaders and healers in the US, Canada, Europe, Asia and Australia. 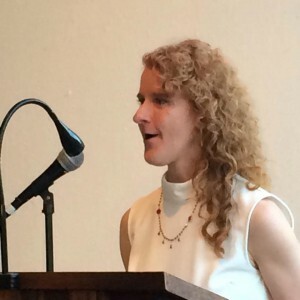 She teaches at various conferences and festivals, including EDGE, Symbiosis, Pantheacon, Spiritweavers, Bioneers, Lightning in a Bottle and various spiritual and artist retreats all over the world. Gerri will be reading with the Fierce on the Page Reading Series on Wednesday, October 26. If you’re in the Portland, Oregon area, you won’t want to miss this.